There is absolutely no chance that I would teach anybody to perform a Stoppie with his motorcycle and no rational, mature, mortal human being should intentionally try to do one. But because you might be riding an unfamiliar bike, or because of incredibly poor skills, or even because of trying too hard to master emergency braking technique, you just might find yourself sitting in your saddle when the rear-end of the motorcycle lifts its rear tire off the ground. Must you end up in that case being thrown over the handlebars and landing face first on the asphalt? Absolutely not! Let me emphasize some concepts here. A Stoppie is NOT when your rear tire comes off the ground - that happens with some regularity, from being overly aggressive with your REAR brake (your rear shock contracts and lifts the rear tire off the ground) or when riding over bumps on the pavement. Rather, a Stoppie is the result of being overly aggressive with your FRONT brake and causing so much weight transfer to occur that the resulting weight on the rear wheel becomes negative. That is, your bike's rear-end lifts into the air and drags that rear tire off the ground with it. Some motorcycles simply cannot, under normal conditions, perform a Stoppie. GoldWings and most Harley-Davidsons, for example. Sport bikes, on the other hand, are quite prone to doing Stoppies. Why? The ratio of the height of the bike's CG as compared to its wheelbase determines how efficiently weight transfer will occur for any given deceleration rate. 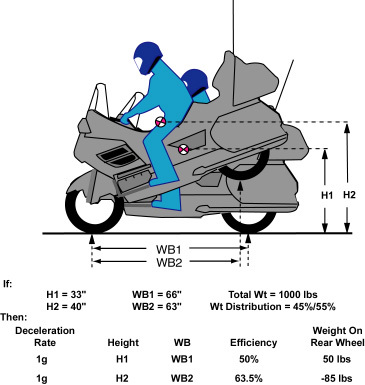 A GoldWing's Weight Transfer ratio is usually very close to 1:2 (50%) while a sport bike, because of their relatively short wheelbase, will have a Weight Transfer ratio closer to 55%. What that ratio does is determine how much weight transfers from the rear wheel of the bike to the front during deceleration. Suppose that the combined weight of the bike and rider is 1,000 pounds and it is distributed 55% on the rear wheel and 45% on the front wheel when the bike is not in motion. If that bike decelerated at a rate of 1g (32.2 ft/sec/sec) and had a Weight Transfer ratio of 50%, then 50% of 1,000 pounds would move from the rear tire to the front tire. As there was 550 pounds on the rear tire when the bike was not moving, when 500 pounds are removed from it there is still 50 pounds of weight holding that rear tire on the ground. Now if your rate of deceleration were only .5gs, then you would have transferred only 275 pounds of weight, but if you managed to attain a 1.1g rate you would transfer 605 pounds and the rear end weight would be negative. A Stoppie would occur. HOWEVER, the traction of your front tire is almost never sufficient to support a 1.1g rate of deceleration without skidding. So BEFORE a Stoppie would occur you would wash out the front-end. That's true for the GoldWing and HD, typically. But in the case of a sport bike with a combined weight of 600 pounds, distributed 50% on the rear wheel and 50% on the front, then at rest there is 300 pounds of weight on the rear tire. If you were to brake (decelerate) at the rate of 1g on that bike, and if it had a Weight Transfer ratio of 55%, then 330 pounds (55% of 600) would be removed from the rear tire and moved to the front one which would make the weight on the rear tire a total of MINUS 30 pounds. THAT is doing a Stoppie. In fact, the weight transferred from the rear wheel to the front on a sport bike is usually sufficient to cause a Stoppie when you reach a deceleration rate of about .95g's. Because your front tire has sufficient traction to not skid at .95g's, a sport bike will do a Stoppie BEFORE it can do a front tire skid - usually. What that means is that because the height of the CG grew and the wheelbase shortened, the Weight Transfer ratio INCREASED! Indeed, the higher the rear wheel gets, the higher (more efficient) that ratio gets and, thus, the MORE WEIGHT is moved from the rear to the front wheel. I trust that you now see where this is leading. IF YOU DO NOTHING when your Stoppie begins, YOU WILL GO OVER THE HANDLEBARS!!!! You MUST reduce your braking effort in order to stop (or reverse) the weight transfer increase. What that means, in turn, is that the maximum rate of deceleration you can achieve with a sport bike is that rate at which a Stoppie occurs while a bike that cannot normally do a Stoppie can stop more quickly - even without skidding its front tire.